View of the Castor River on opening day 2017. This entry was posted in Duck hunting and tagged Castor River, decoys, duck hunt, duck hunters, mallards, Ontario, opening day, Russell, Thomas, Waterfowl hunting, wood ducks on September 23, 2017 by geoffreyandmika. Opening day of duck season 2014 was unseasonably warm as the hot, humid weather Jason and I experienced on our recent grouse and woodcock hunt continued. I was up at 4:00 am, having breakfast before putting my shotgun, shells and cameras in the car and heading to meet Jason and his brother Maurice at Jason’s house. I stopped to have my thermos filled with Tim Horton’s coffee on the way and arrived 20 minutes early. We were on the road to the farm near Russell, Ontario, with Nos on board, planning to pass shoot ducks on the Castor River, by 5:00 am. It took us 30 minutes to drive there from Jason’s house. This was the first time since he and his wife Fran bought the house earlier in the year. It is good to know how long the drive is for future hunts. We carried our shotguns and gear down to the spot at the river’s edge we set up to watch for the morning flight. Nos was champing at the bit. We had a little trouble getting our bearings at first. The walk to the river’s edge takes us through a corn field. The stalks are very tall this year. We found the spot soon enough and I set up the camcorders, so we could catch the action on video. As it happened, there was very little action. There were a few passing wood ducks early on and then nothing. We sat and watched the sunrise and observed the skies that were filled with Canada geese. We heard volleys of shots in the distance, so other groups of hunters were seeing action, presumably shooting at Canada geese heading to harvested bean and wheat fields. I shot at a couple of passing wood ducks, missing spectacularly. Jason and Maurice shot at a trio of passing ducks, missing spectacularly; that was the extent of our action for the morning. It certainly was not the best opening day we experience, but we took it in stride. You will not get any ducks sitting at home and there is no guarantee when you take to the field that you bag any birds. We called it a hunt 2 hours into shooting time and packed up the gear. We stopped to chat with our host, Eric, before leaving. He told us the soybeans will not be harvested for another 2-3 weeks. We hope the harvest is completed sooner than later as we are eager to come back and gun for the abundant Canada geese. As I got home earlier than I anticipated I thought I might as well take Hera out to the Marlborough Forest for a sweep of the cover at Lester’s Square. The fact that the temperature was 32 degrees C with the humidity was not lost on me; it is not the best weather, nor the time of day–late in the morning–to be taking a dog into the field. However, Hera was wound up as she was left at home when I went duck hunting, so off we went. On the drive into the forest I saw a turkey on the trail in front of us. The turkey hightailed it into the woods. We got to Lester’s Square and had it to ourselves. Before long as we made our way through the coverts, I was reminded of the popular song by Noël Coward with its refrain of “Mad dogs and Englishmen go out in the midday sun.” It was frightfully hot and humid. I made sure to bring Hera to the wetlands in the coverts so she could cool off. We completed the sweep by 1:00 pm. She bumped one woodcock in a patch of cover I expected to find birds. It was just too hot to be out. On the drive out there was an incident. As I neared the end of the forest road where it meets Roger Stevens Drive, the road I take to get home, 3 people on trail bikes (a man, woman and child) came racing around a bend in the forest road. I braked and came to a stop so they could adjust their speed and pass, safely. Unfortunately, they were driving too fast, so when the man, who was in the lead, stopped, the child could not stop soon enough and rode into the side of the man’s trail bike, causing them both to fall over. The man got up and glared angrily at me, like it was my fault, then grabbed the child roughly. While the child was comforted by the woman, he picked up the downed trail bikes and gestured to me to move on. I continued on my way. I was afraid for a moment this situation would get uglier, but I kept calm and expressionless throughout. The forest is used by non-hunters as well as hunters, something that is not lost on me. When I am driving the forest roads I drive at 20 30 km/hour with my own safety and that of others in mind. 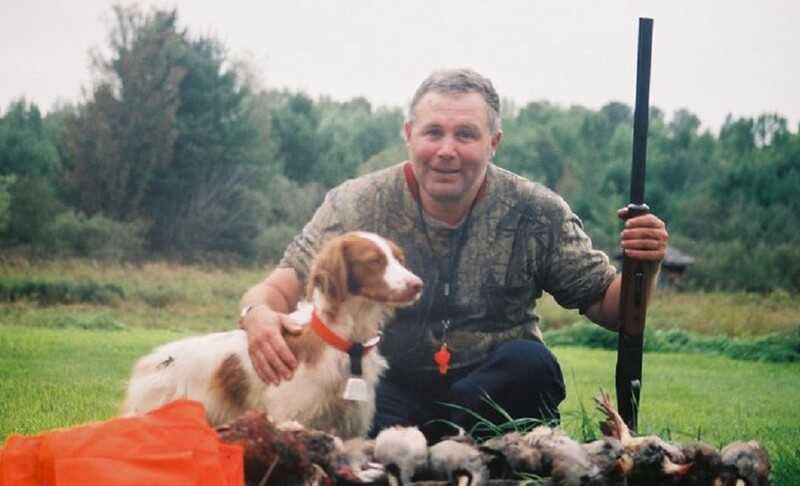 This entry was posted in Brittany (dog), Duck hunting, Gun dogs, Hera, Hunting dogs, Pointing dogs, Ruffed grouse hunting, Small game hunting, Woodcock hunting and tagged Brittany (dog), Brittany Hera, Canada geese, Canada goose hunting, Castor River, coverts, duck hunt, duck hunters, duck hunting, German Wirehaired Pointer, German Wirehaired Pointer Nos, Jason Quinn, Marlborough Forest, Maurice Quinn, opening day, pointing dog, Ruffed grouse, small game hunting, upland game, upland gunning, Waterfowl hunting, waterfowlers, waterfowling, wood duck, wood ducks, Woodcock, woodcock hunting on September 27, 2014 by geoffreyandmika.